Who else loves travelling but suffers from holiday fatigue almost immediately at the thought of planning the itinerary, lodging and routes to take to get the most out of your trip? 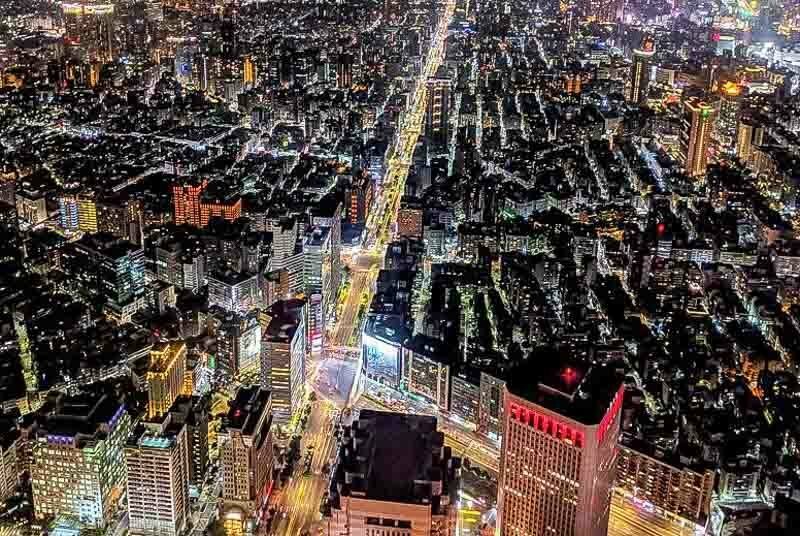 The last time I visited Taipei, I remembered fussing about the aforementioned and wished there was a better way to getting around — well, wish no more! If you think that’s convenient, it also has discounts on hotels and food, saving you up to 60%. We opted for the Unlimited 3-Day pass (NTD1,900), there are also Unlimited 2-Day (NTD1,600) and Unlimited 1-day (NTD1,200) passes catering to your travel needs. 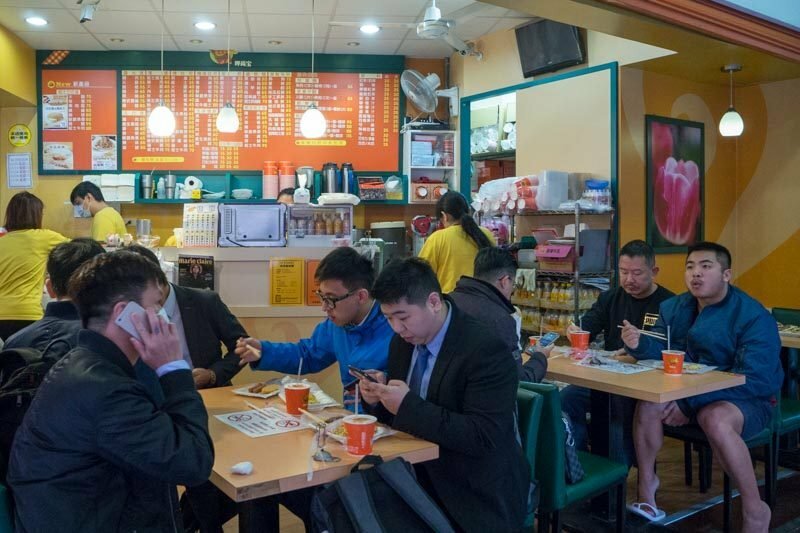 Rise and shine to the vibrant breakfast scene at JSP Ximen (甲尚宝), which was just a stroll away from our hotel near Ximending. Serving up classic Taiwanese breakfast staples, you’ll find pork burgers, spaghetti, Chinese egg pancake and more. 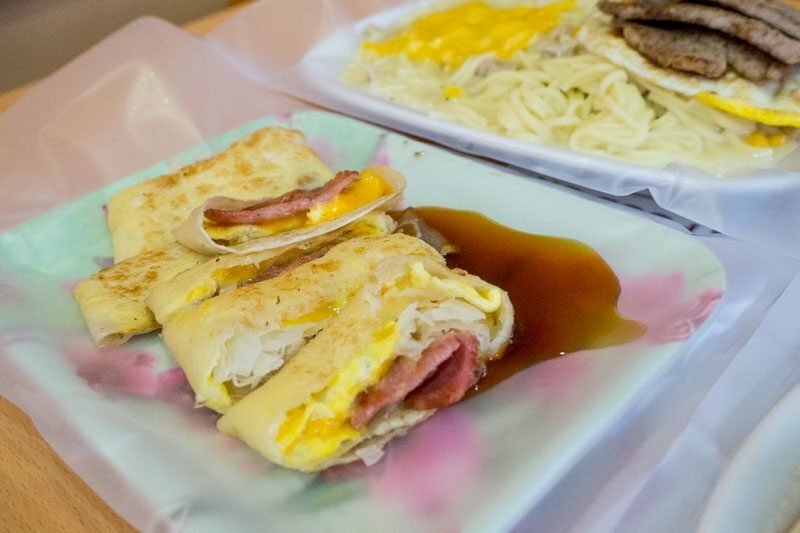 I opted for the Chinese Egg Pancake with Ham (NTD55), which was loaded with egg and ham, drizzled with sweet soy sauce. Filled with the two main ingredients that defined my version of a ‘breakfast of champions’, I was ready for the day. 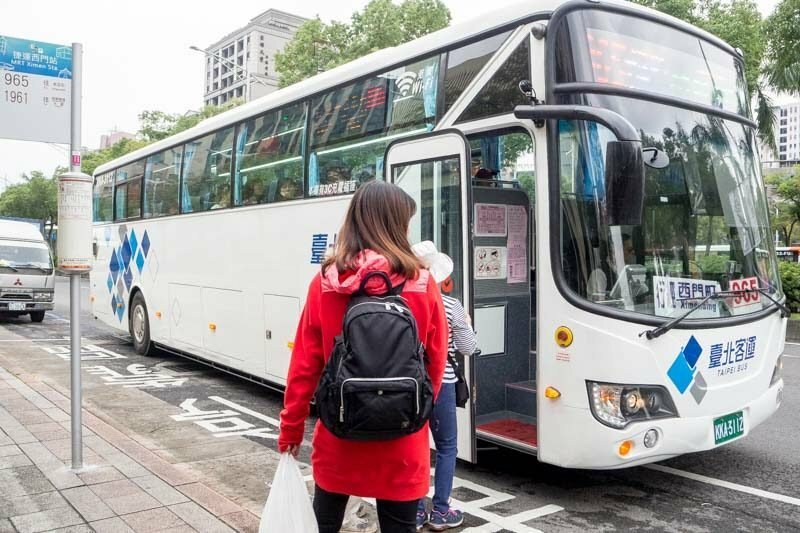 After breakfast, it was onward to our trip by boarding the buses with our Taipei Fun Pass to get around to the various locations. We took bus no.965 to our first stop: Gold Museum. 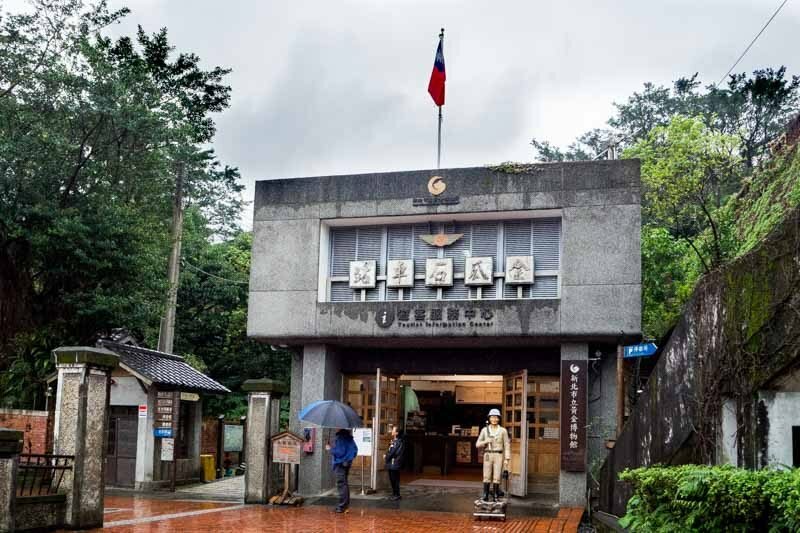 The Gold Museum, nestled up in the mountain of Ruifang District, is chock-full of history and interesting stories to tell of the dazzling past of the gold mining days and lifestyle of the people who once sought after a chance to strike rich. Just when I was intrigued by the stories of old, the huge gold bar currently priced at NTD268,105,100, displayed in the museum caused my eyes to light up. 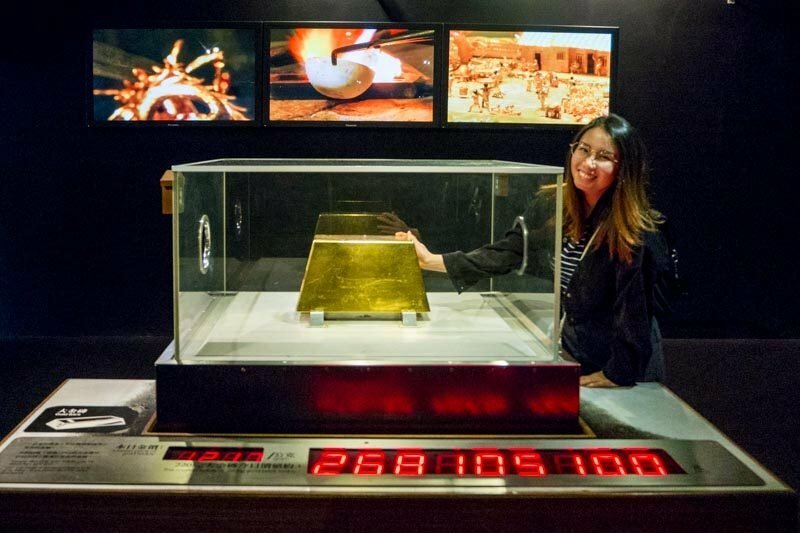 Visitors are allowed to touch the gold bar, and me being a true kiasu Singaporean, rubbed it vigorously hoping it’ll bring good fortune for the coming year — Huat ah! Getting there: Take Taiwan Tourist Shuttle (Gold Fulong Shuttle Bus). 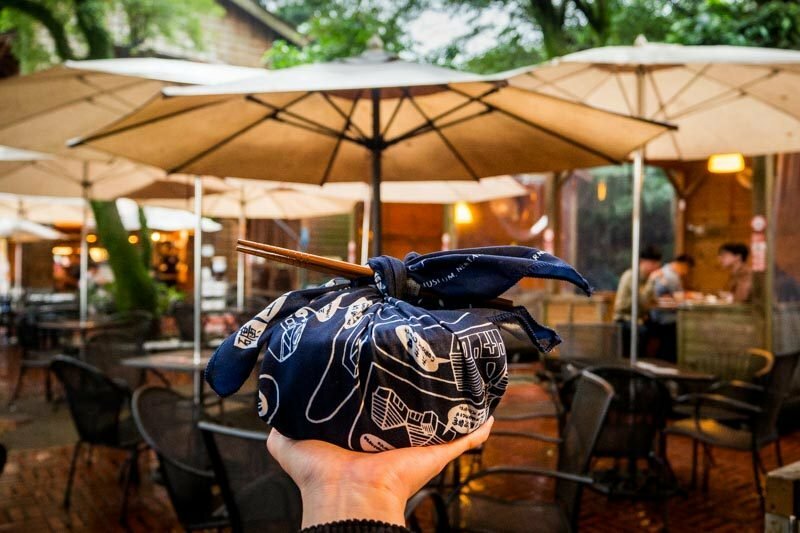 All that gold rubbing soon made me hungry, and we got ourselves a Mine Worker’s Lunch Box with Black Tea (NTD290) at Fun Farm Restuarant in New Taipei Gold Museum, which came wrapped in a handkerchief and a pair of wooden chopsticks that you can keep after the meal. 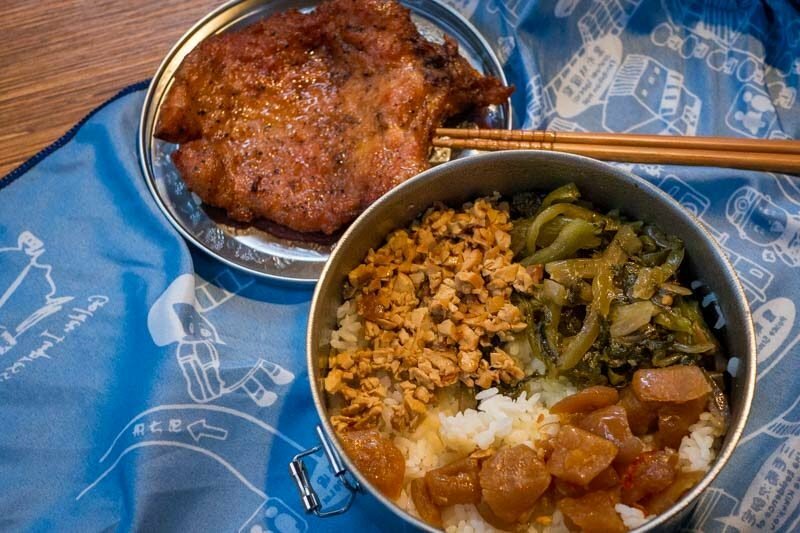 I simply adore biandang (便当) or ‘packed meals’, because it reminds me of home-cooked meals and the heart put into preparing it. The rain and the hut we were seated in played a big part in creating the atmosphere, and for a brief moment, I wondered if this was how the gold miners felt ending a day’s long work with a warm hearty meal. Packed with a generous slab of pork chop, pickled vegetables, tofu and a bed of steamed rice, I couldn’t help gobbling down the food and feeling full in my stomach and heart. 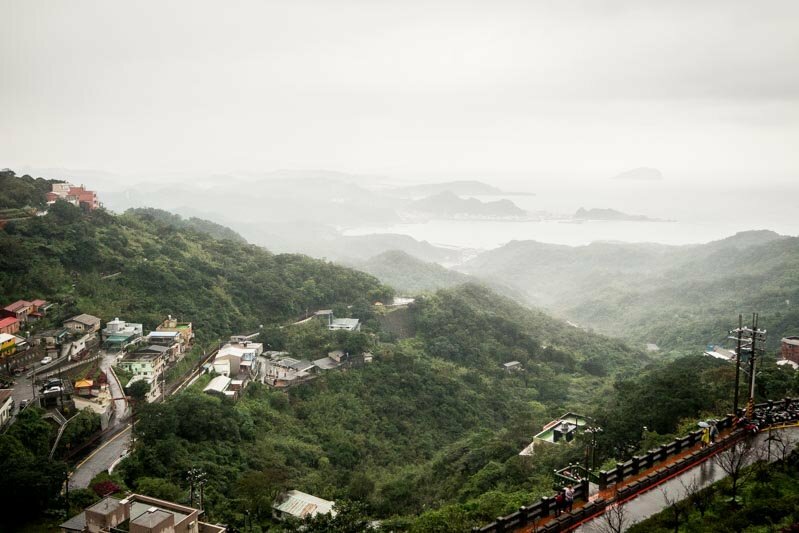 Just a short distance away from the Gold Museum, Jiufen Old Street (九份老街) was once touted as the ‘Little Shanghai’ or ‘Ginza’ in the gold mining days. 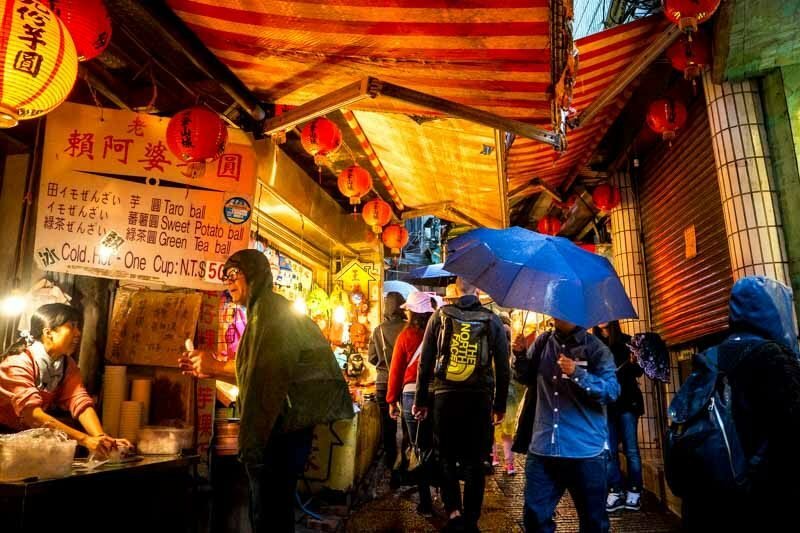 It seems like business hasn’t slowed down since, and it is now filled with little stores in winding alleys selling Taiwanese street food, knick-knacks and souvenirs to bring home. Shop a little further, off the main shopping alleys and you’ll be greeted by the views of the mountains, where you can make a quick stop to take in the scenery or a shot for the ‘grams. 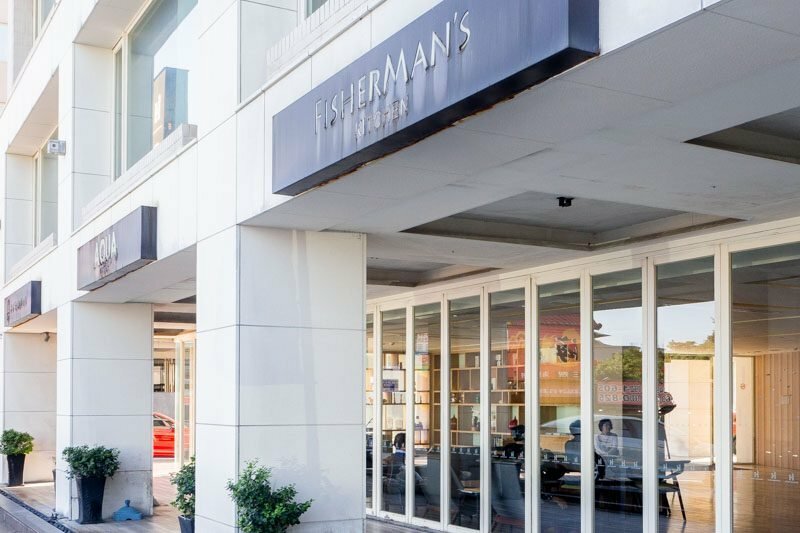 Take a break from all that walking around and shopping with a bird’s eye view of the city at the Miramar Entertainment Park just across Jiannan Road Station. 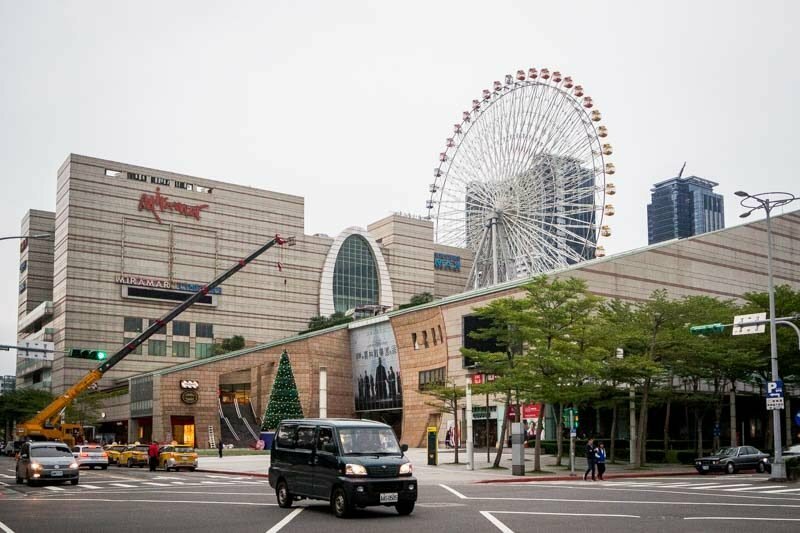 Have your Taiwan Fun Pass scanned and exchanged for a ticket to ride the Ferris Wheel. 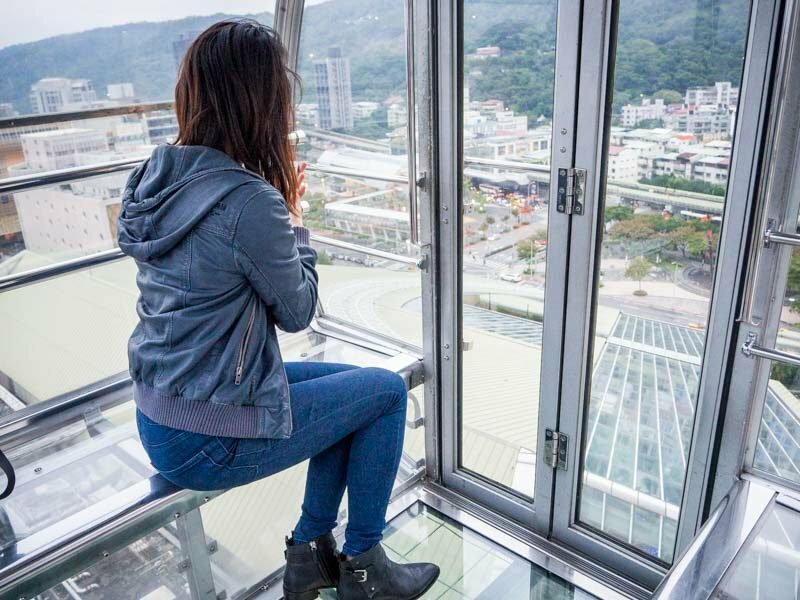 We queued up for the clear glass cabin and it was definitely worth the wait, even the seats were see-through, giving a clear 360 view of what’s down below throughout the 17-minute ride. Getting there: Take the MRT (BR) Wenhu Line to Jiannan Road Station Exit 3. Dian Shui Lou (點水樓) was by far the best restaurant I’ve been to in Taiwan. 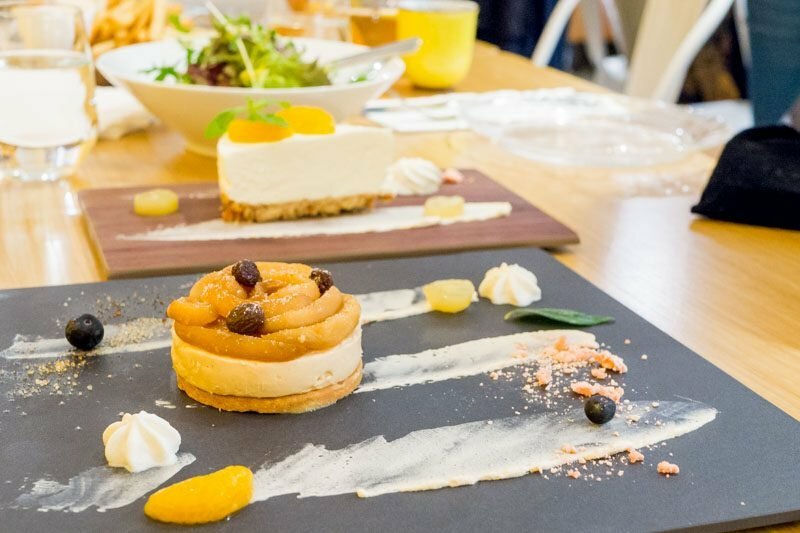 If you’re planning for a large gathering, there are also private rooms to host your guests. The Steamed Spicy Dumpling (麻辣小笼包) from the 8 Colour and Flavour Dumplings (天然蔬果源汁七彩小笼包), was calling out to me with its striking red streaks on the dumpling’s skin. A bite into it and a spurt of mala broth awakened my taste buds, though I would have liked it to be spicier, it was a unique take to the usual xiao long bao. 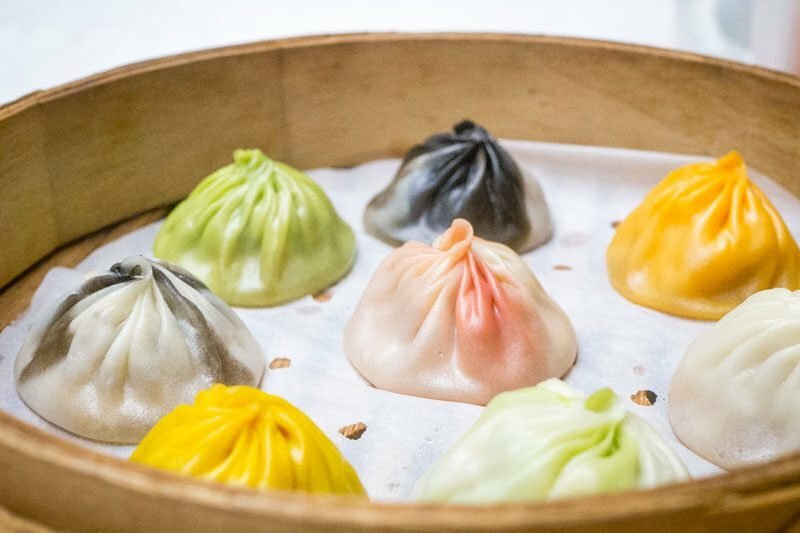 Be sure to present your Taiwan Fun Pass to get a FREE Original Dumplings (小笼包) when you order the 8 Colour and Flavour Dumplings. 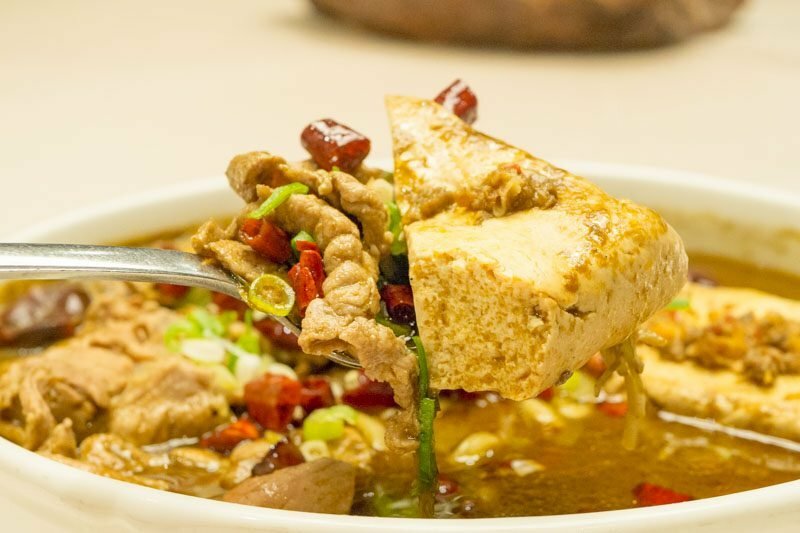 The best dish was the Sliced Pork and Stinky Tofu in Spicy Sauce (麻辣梅花臭) (NTD880). Coming from someone who goes around the night markets to sniff out the smelliest tofu to have, this dish was deliciously pungent. Combine mala and smelly tofu, and you have a wicked (in a good way) combination in a dish. 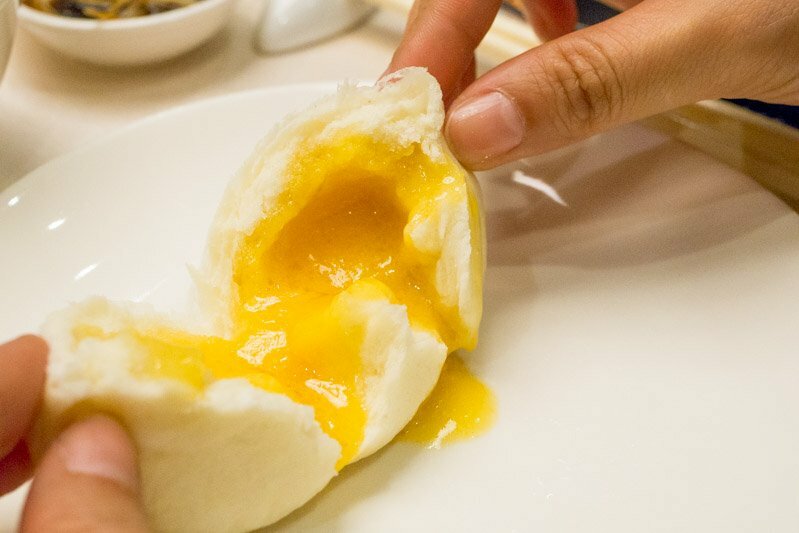 Round off the meal with the Steamed Mashed Salty Duck Egg Yolk & Custard In Mini Bun (奶皇玉露包) (NTD90). You can’t go wrong with the flowy, comforting warm salted egg yolk custard. 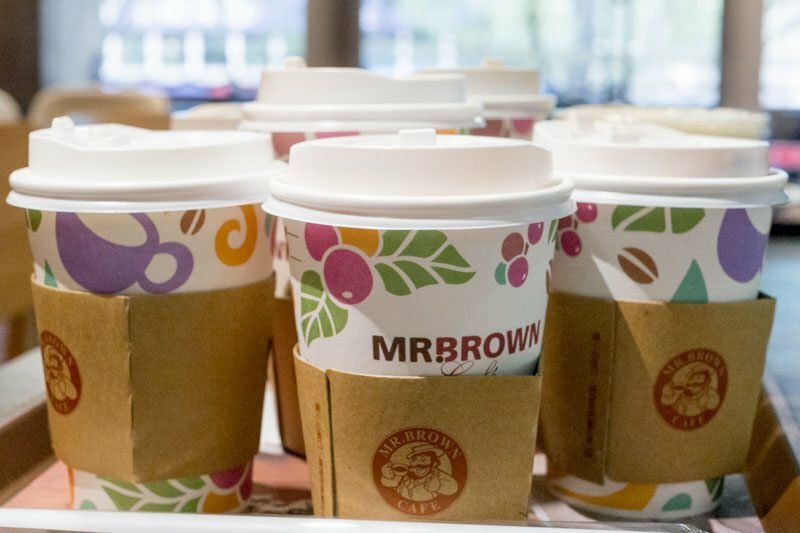 Our go-to coffee run was Mr. Brown Cafe. With the Taiwan Fun Pass, you can buy a drink from the Latte Series and get the second cup at 50% off. 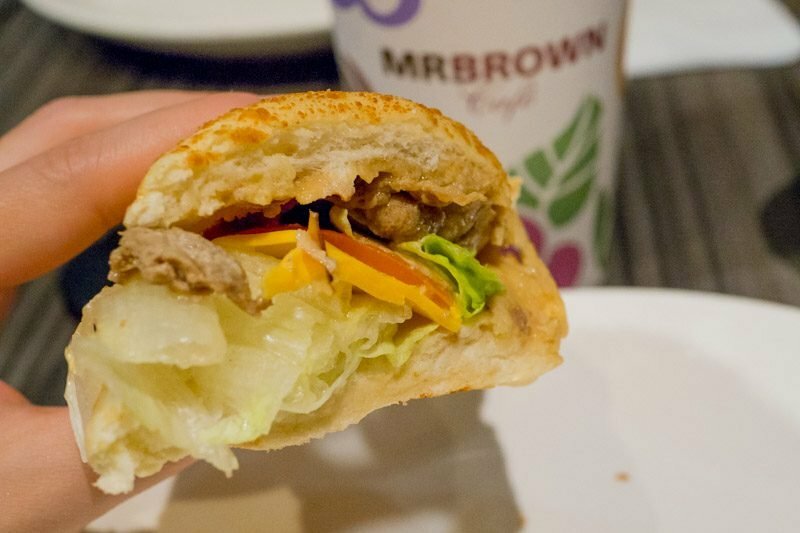 While you’re at it, the sandwiches are pretty good too for breakfast or a quick bite when you’re feeling peckish in between visiting the various attractions. 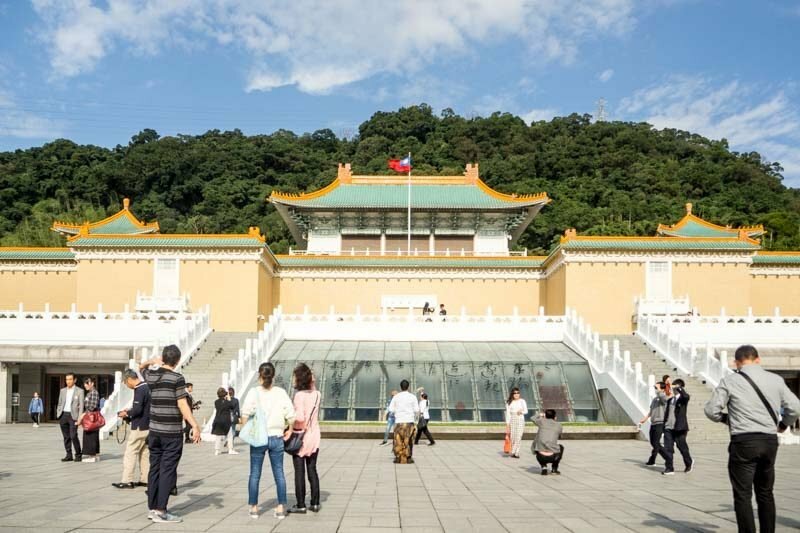 An iconic attraction in Taiwan, the National Palace Museum houses many prized gems and has over 690,000 pieces of ancient Chinese artworks on display. You could easily spend two hours here going through the exhibitions. 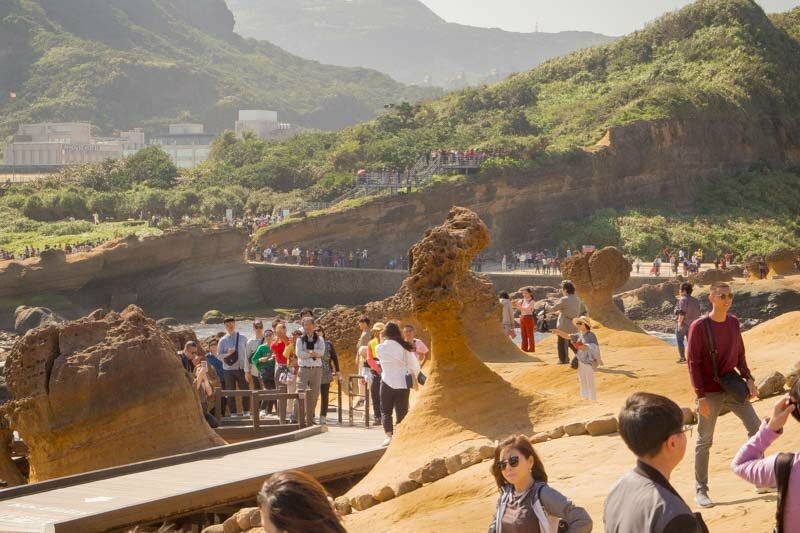 Skip the queues and enter the museum by tapping your Taiwan Fun Pass card at the entrance. 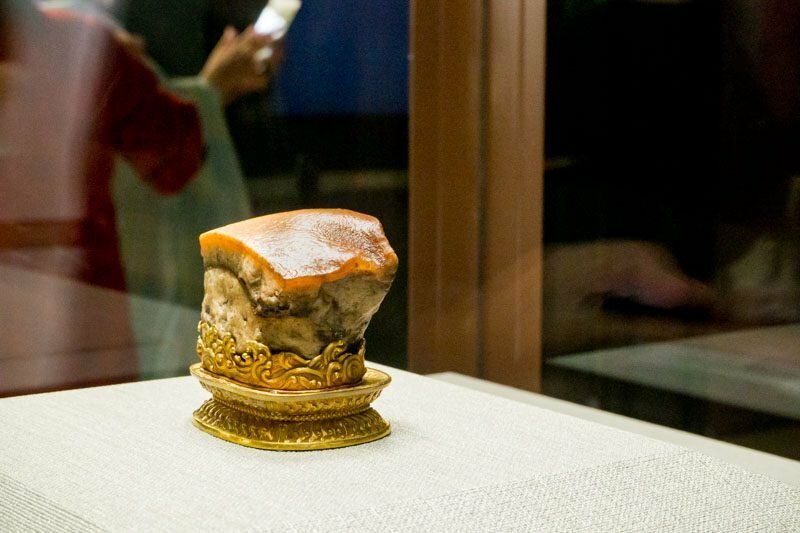 I wasted no time and went straight to the Meat-shaped Stone (肉形石), which is one of the Three Treasures of the National Palace Museum, carved to look like a piece of braised pork belly. And yes, I may have salivated while staring at the glistening stone. There’s also the Jadeite Cabbage, which was on loan at our time of visit. 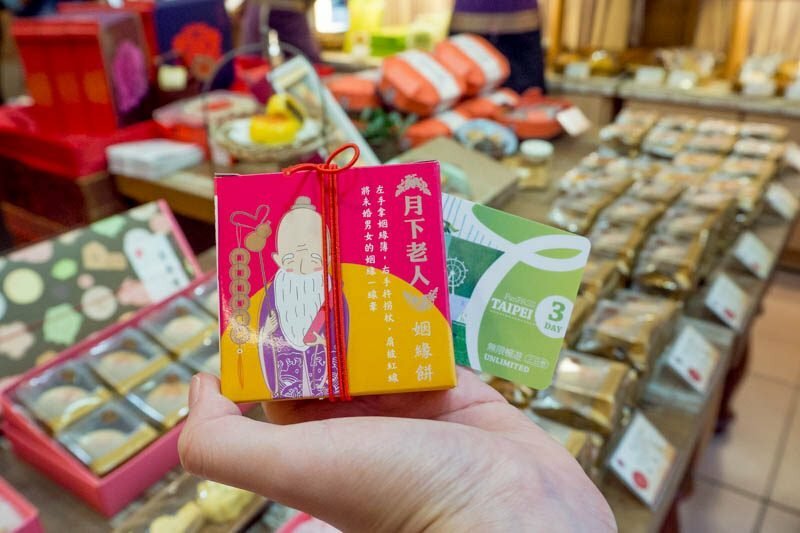 But we were happy to see mini replicas of it that you can bring home, along with other souvenirs that can be bought at 10% discount with the Taiwan Fun Pass. Getting there: Take MRT (R) Tamsui-Xinyi Line to Shilin Station Exit 1, and transfer to Bus R30 or other buses that go to the museum. 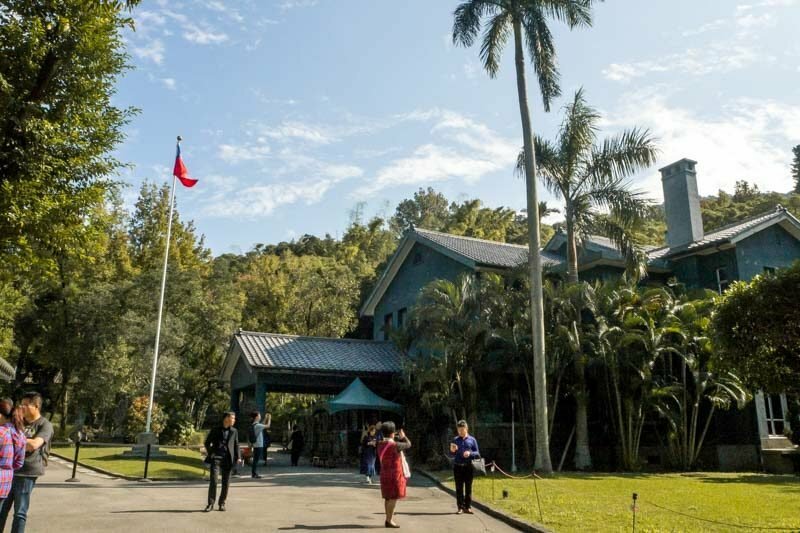 The Chiang Kai-Shek Shilin Residence was where the former President and his wife lived, no photography was allowed in the premises, but I promise it’s time worth taking to learn about their private life while you walk through the halls and rooms. While you’re there, slow down your pace and admire the flowers in the vast garden that Mr Chiang had built for his wife, knowing that she likes flowers. Getting there: Take MRT (R) Tamsui-Xinyi Line to Shilin Station Exit 2, and walk about 10 minutes. We took a break at the Coffee Alley after roaming the vast grounds of Chiang Kai-Shek Shilin Residence, which was just a stone’s throw away. The large windows allowed the sunlight to flood in, making the cafe a wonderful place to relax and hold conversations over a cup of tea and some food. 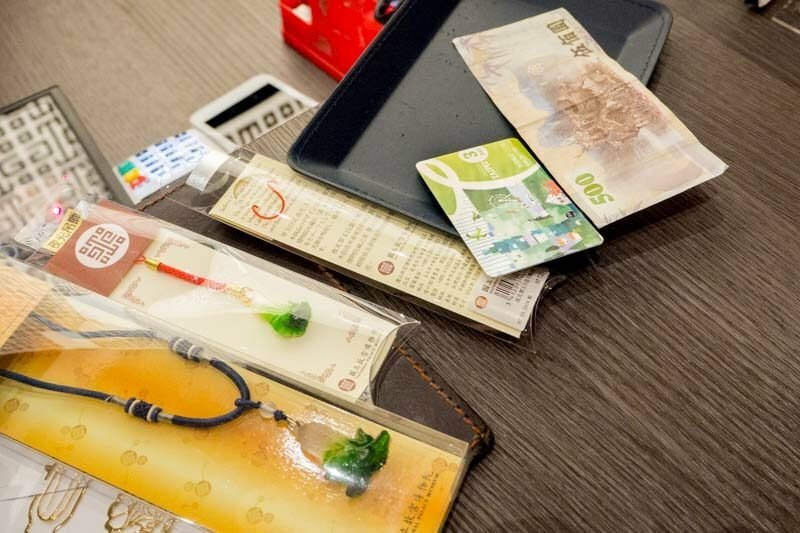 Top it off with 10% off any items on the menu when you flash your Taiwan Fun Pass. 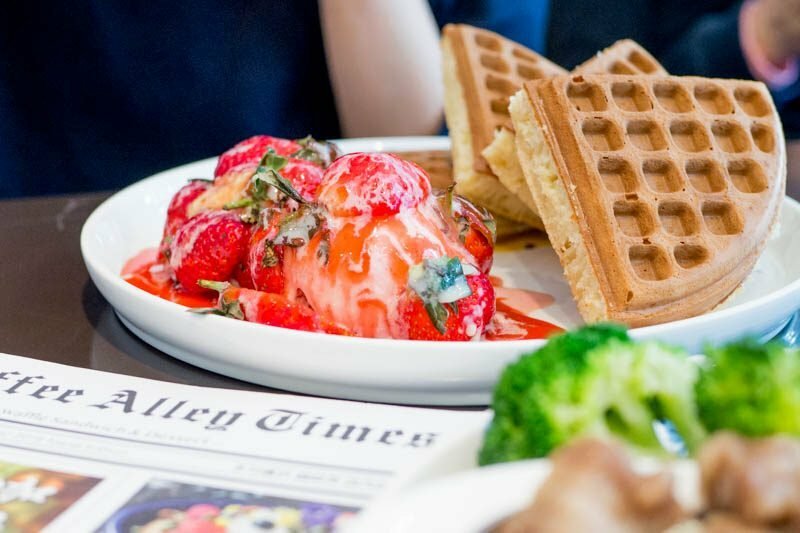 Famous for its waffles, my dining partner ordered the Waffle with Fresh Strawberry, Ice Cream and Custard (NTD220). The waffles were crispy on the outside and fluffy on the inside, accompanied by the ice cream that was generously topped with strawberries and drenched in strawberry sauce. A must-try when you’re here. 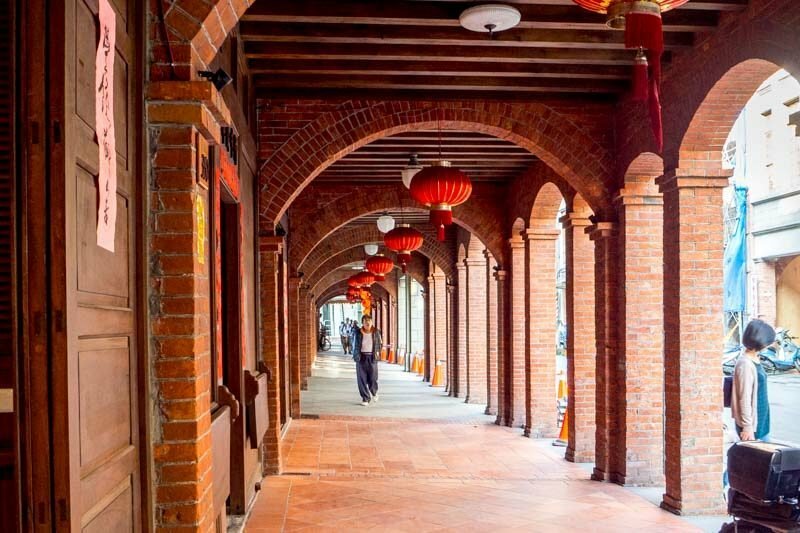 Travel back in time when you wander around Dadaocheng (大稻埕) and experience what olden day Taipei was like. I loved that the streets are juxtaposed with old and new shops, ranging from medical halls, craft shops and cafes. 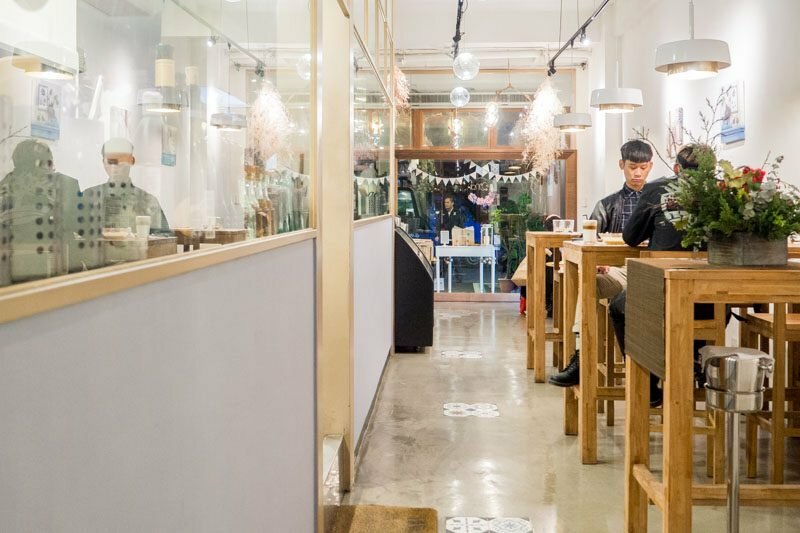 It’s a haven for hipsters, especially if you’re looking for something different to see in Taipei. 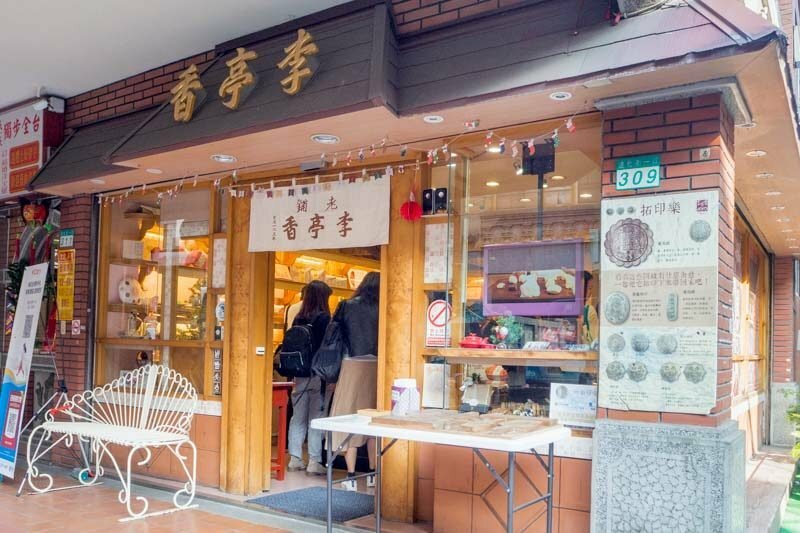 Drop by Lee Cake (李亭香) to stock up on Taiwanese snacks and traditional pastries along the way. You can even pick up a paper and colour pencils from the desk outside the shop to etch a drawing of the pastries they sell. I redeemed a complimentary box of match-making cake, which is said to bless you with a partner and a long-lasting relationship. Cue Beyonce’s Single Ladies. Getting there: Take MRT (O) Zhonghe-Xinlu Line to Daiqiaotou Station Exit 1, walk along Sec 2, Yanping N. Road for about 7 minutes. Muhills Restaurant (牧山丘) is located in Dadaocheng and we had the pleasure of dining in this whimsical-looking restaurant that serves up Western food and desserts. The A.O.P with Parsley and Prawn (NTD460) was fragrant and laced with olives, bell peppers and mushrooms for a textual mouthfeel. 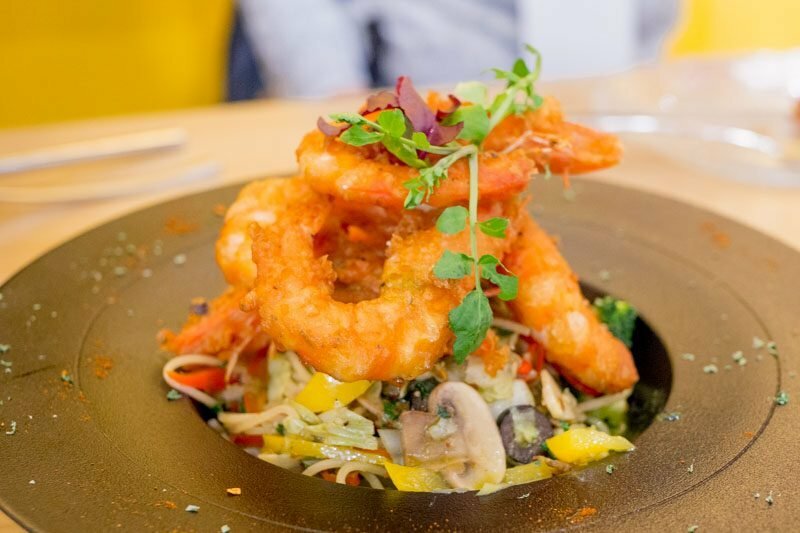 The plate was stacked high with prawns that were fresh and juicy, making it worth its price. Don’t forget to leave room for desserts too, which were all so prettily platted like an artwork. Do note that there is minimum spending of NTD200, not inclusive of desserts and drinks during lunch and dinner. 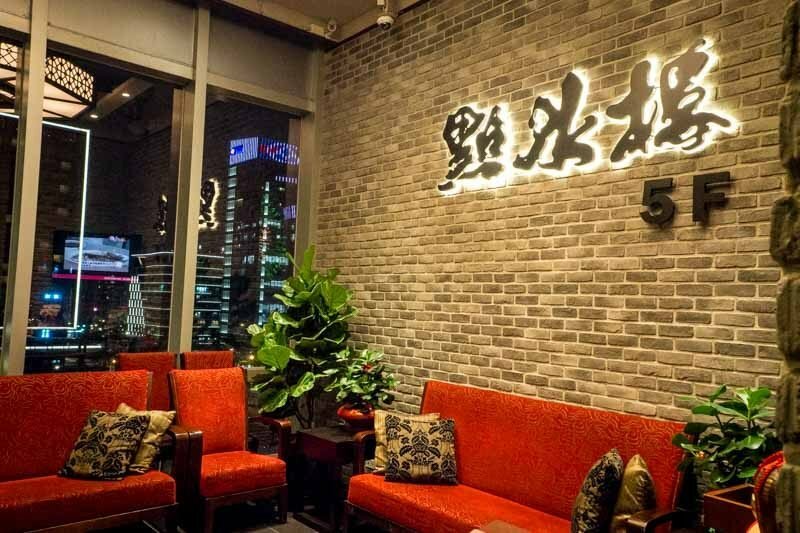 The Taipei Fun pass gets you 10% discount off your total bill. Ahh~ the iconic Taipei 101. You can’t go to Taipei and not go to Taipei 101. Pics or it didn’t happen! The best time to go is during the golden hour to watch the sunset and the city lights come on from the 89th floor of the building. Also, it is the first building to have one of its gargantuan tuned mass dampers (a shock absorber) open to the public’s view, which is responsible for reducing up to 40% of the building’s sway. You don’t know how happy the nerd in me was to take home this nugget of information. 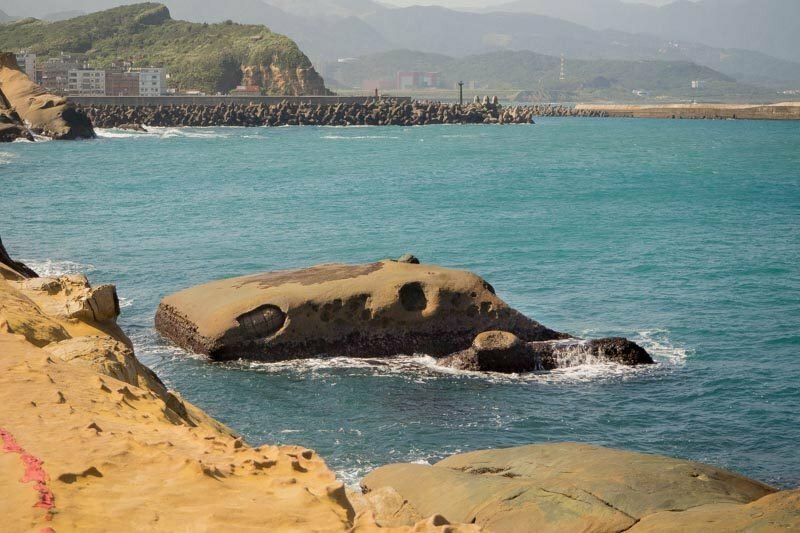 Yehliu Geopark is an epitome of the wondrous yet mysterious world we inhabit with its natural rock formations eroded by the sea. The rock formations resembled everyday items and the famous Queen’s Head (pictured above). There’s even a queue to take pictures with it! Pro-tip: We skipped the line and went to the back of the Queen’s Head. Look out for cute formations like the Elephant Rock and the Fairy’s Shoe that’s right beside it. 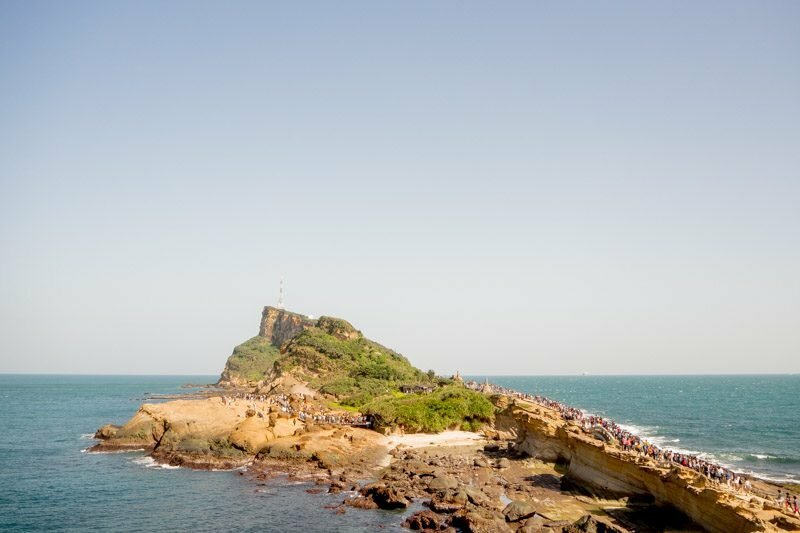 Getting there: Take Taiwan Tourist Shuttle (Crown Northern Coast Shuttle Bus) to Yehliu Geopark. 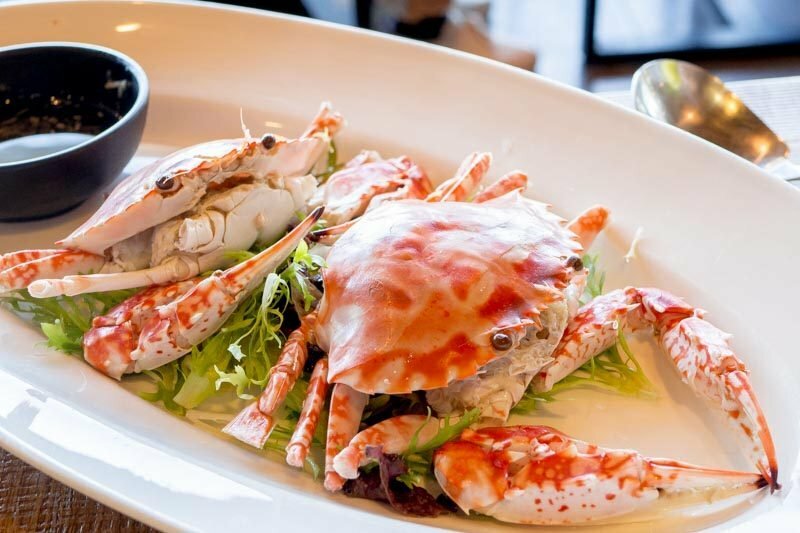 Make sure to keep your stomach hungry as you’ll want to treat yourself to a buffet at Fisherman’s Kitchen, located just outside Yehliu Geopark, along the street. 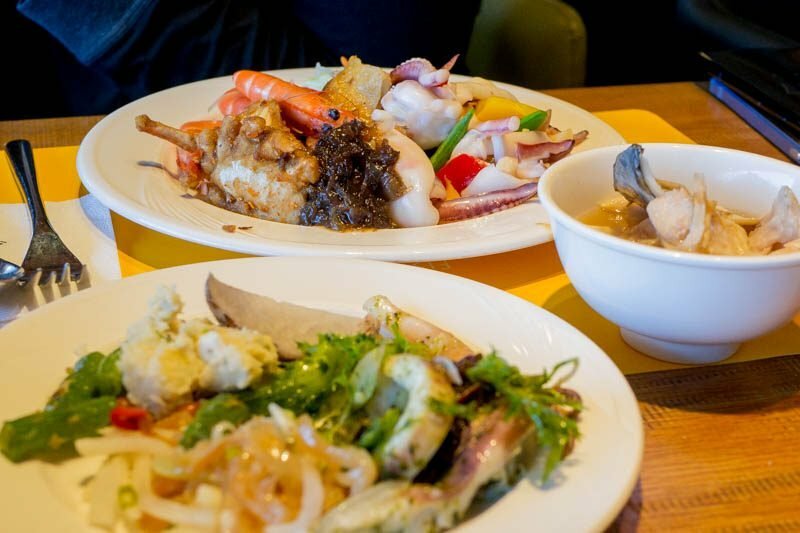 The buffet line offers mainly seafood dishes. Considering how near we are to the sea, the prawns, squid, crabs and other seafood were fresh and succulent. 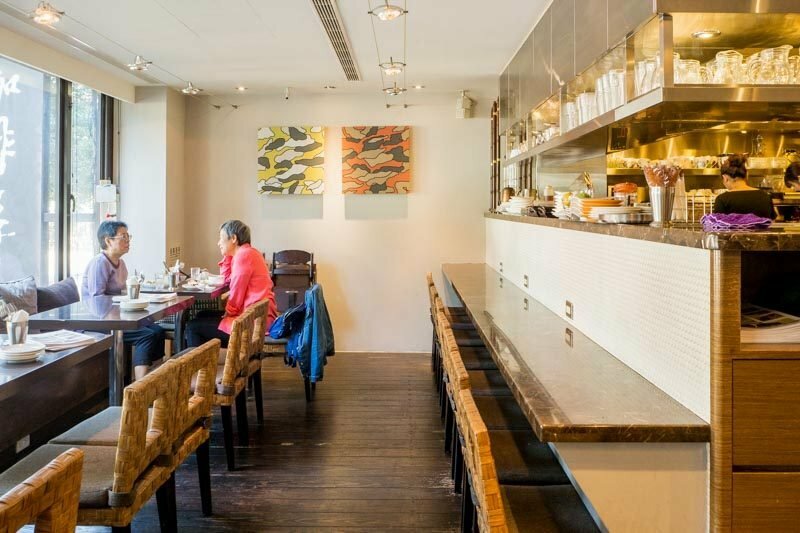 Take 10% off your bill with the Taipei Fun Pass. 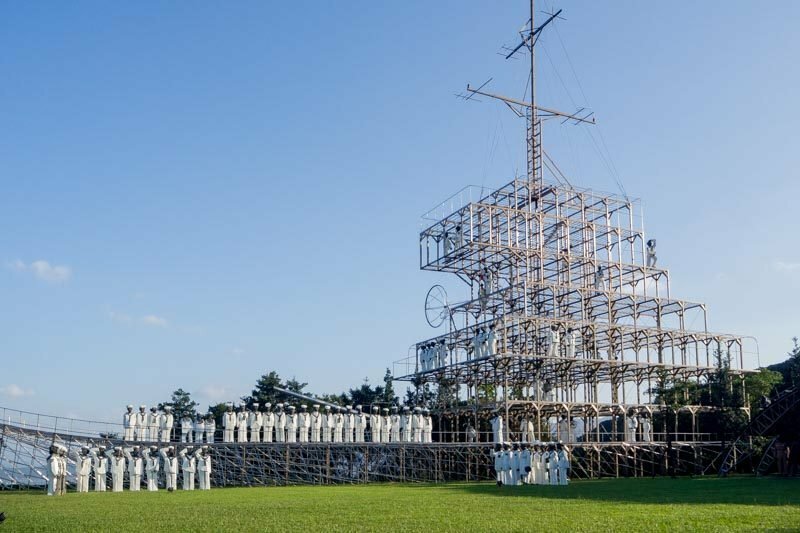 Enjoy a quaint stroll in the premises of Juming Museum while admiring the works of Taiwanese sculptor, Ju Ming, whose works spans across the main building and outdoor exhibition space. Don’t be fooled by the entrance of the museum, the outdoor space is massive and features larger-than-life sculptures. 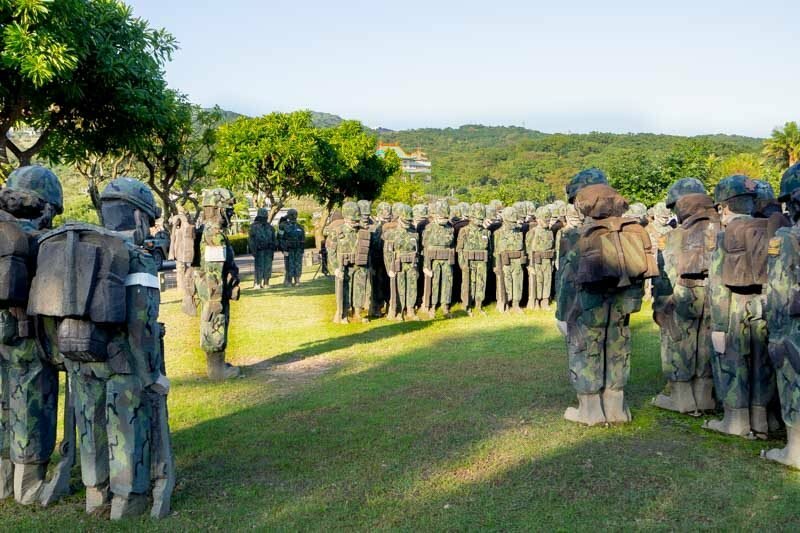 As part of The Living World Series, you’ll find soldiers, sailors and pilots scattered around the outdoor exhibition space, interacting with the surrounding landscapes. 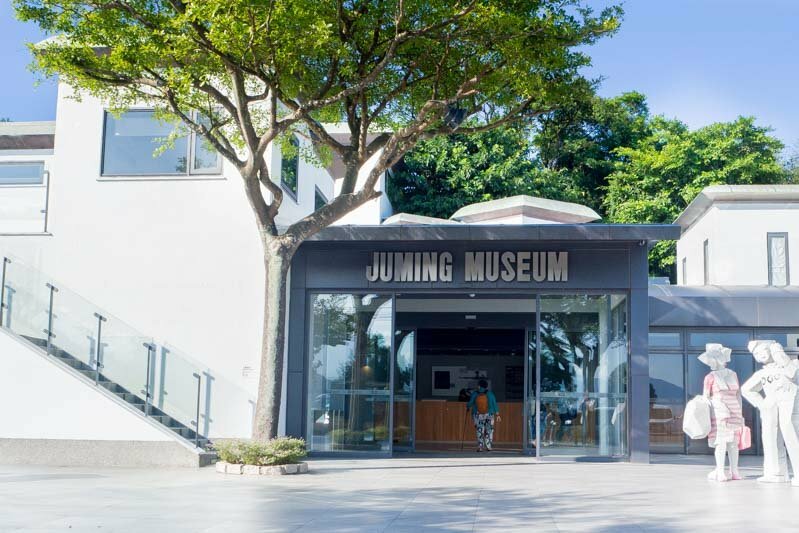 If you find Ju Ming’s sculpture a tad familiar, some of his works had made an appearance outside the National Museum of Singapore and the 12 Gentlemen is currently displayed at Buona Vista Road. Getting there: Take Taiwan Tourist Shuttle (Crown Northern Coast Shuttle Bus) to Juming Museum. Nothing ends a holiday like loading up the luggage with snacks and goodies to bring home, and Carrefour – Guilin Store is opened 24 hours for you to do your shopping at any time of the day. 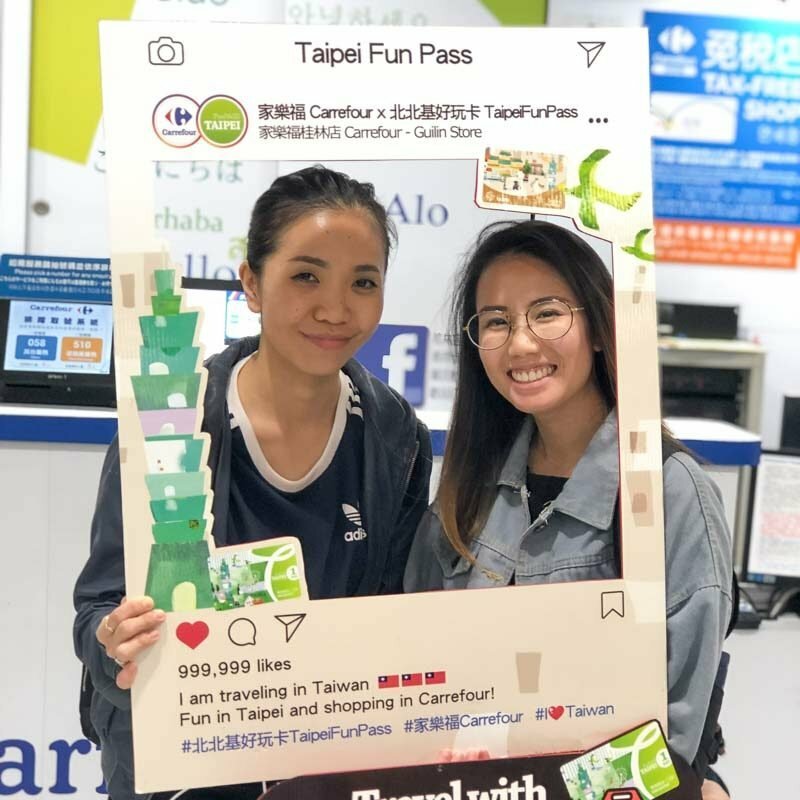 The purchase of the Unlimited Taiwan Fun Pass comes with an NTD100 Carrefour voucher and a gift (we had a box of pineapple tarts) when you upload a picture on Facebook or Instagram of you in the store. 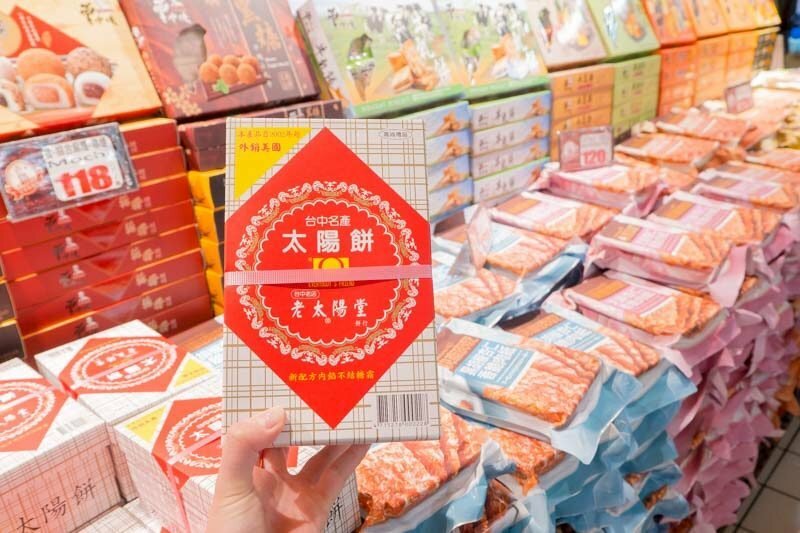 It was a relief to find the snacks I wanted in Carrefour, such as tai yang bing (太陽餅), iron egg, pineapple tarts and more. Oh, the joy of not having to run around the city looking for them. 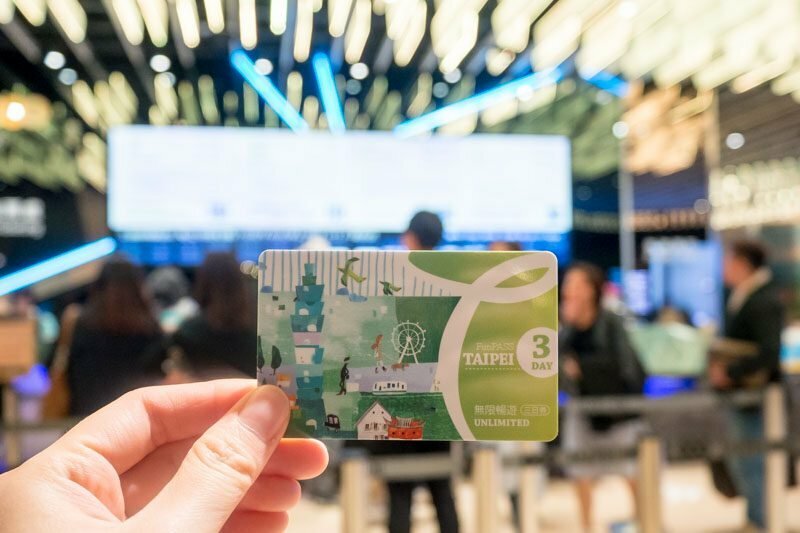 I’m ready to take on Taipei again, as long as I have the Taipei Fun Pass in my hand. A huge plus point was being able to beat the queues. 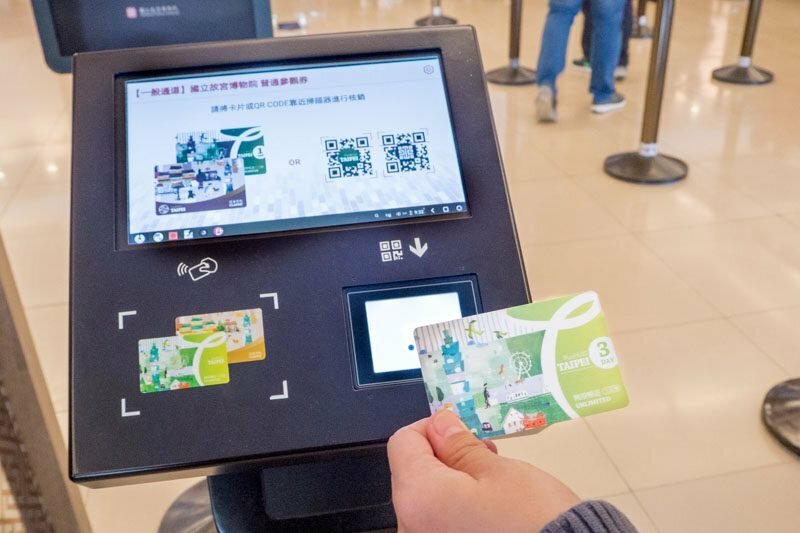 All I needed to do was to scan my card and I could travel around and visit places without fumbling for my wallet to pay for the tickets as they were already included in the pass. 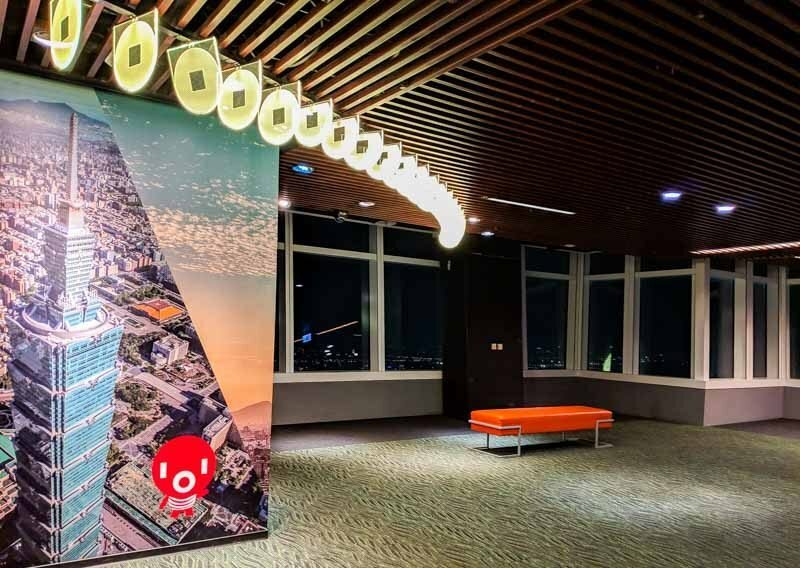 Purchase the Taipei Fun Pass Unlimited version, Classic Version and Taipei 101 Observatory e-Ticket from now till 31 March 2019 and get a Limited Offer – Taipei Fun Pass X TAIPEI 101 Crossover Edition bag, along with three big gifts, NTD700 voucher, and great discounts from eight well-known participating stores. Subject to availability.